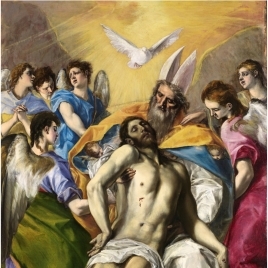 This small panel -it is practically a miniature- is truly exceptional among El Greco’s works. 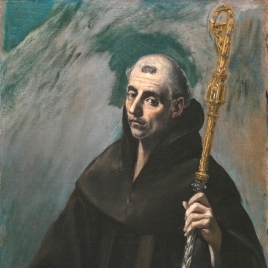 In it, he employs landscape as an essential compositional element while simultaneously demonstrating his mastery of the techniques and expressive resources of 16th-century Venetian painting. The Holy Family is depicted on its journey to Egypt, fleeing the persecution of Herod, who decreed the execution of all babies born in Bethlehem after the Three Kings informed him of the birth of the King of the Jews. 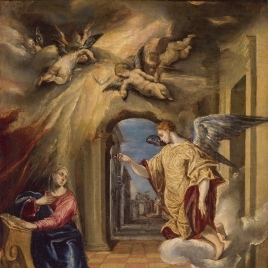 The Gospel of Saint Matthew succinctly narrates this episode: When they had gone, an angel of the Lord appeared to Joseph in a dream. "Get up", he said, "take the child and his mother and escape to Egypt. Stay there until I tell you, for Herod is going to search for the child to kill him". So he got up, took the child and his mother during the night and left for Egypt (Matthew 2: 13-14). The iconography of this simple passage grew increasingly rich throughout the Middle Ages, thanks to different traditions from the Apocrypha and The Golden Legend. Thus, new episodes and characters were added, expanding the original evangelical description. None of these extra-biblical additions appear in the present work. 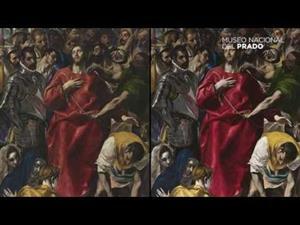 El Greco places the story’s three essential characters in a beautiful and hilly evening landscape. Mary sits on a donkey, carrying her Child in her arms. The infant is depicted as a lively and chubby boy whose curiosity leads him to turn his head to watch Saint Joseph’s efforts to pull the donkey onto the bridge. This uncommon gesture recalls Correggio’s Adoration of the Shepherds and emphasizes Joseph’s active role in the flight. 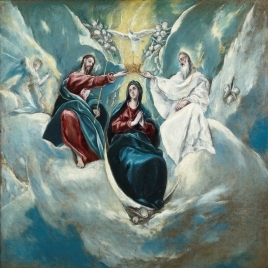 The landscape that El Greco chose for this scene is quite rugged and its predominantly ocher palette contrasts with the intense blue sky filled with cottony clouds. The warm, oblique sunshine fills the scene with its own luminosity, generating a subtle succession of lights and shadows. The fluid, vermicular brushstrokes and the conception of the sky are characteristic of this period. 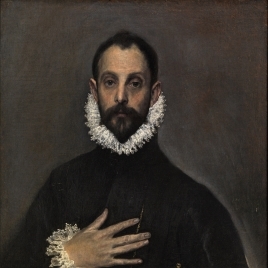 The painting is first mentioned in 1682, when it was at the Palazzo della Vigna, the Roman residence of Gaspar Ménedez de Haro, VII Marquis of el Carpio (1629-1687) (Text drawn from Ruiz, L.: El Greco en el Museo Nacional del Prado. 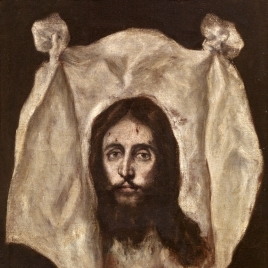 Catálogo Razonado, Museo Nacional del Prado, 2007, p. 32; El Greco. 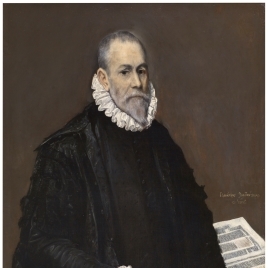 Guía de sala, Fundación Amigos del Museo del Prado, 2011, p. 12). Height: 15.9 cm. ; Width: 21.6 cm. Collection of Gaspar Méndez de Haro y Guzmán, VII Marquis del Carpio and Heliche; probably in the Collection of the House of Alba; Antonio Gorostiza Collection, 1904-ca. 1926; Thomas Andrews Collection, London? 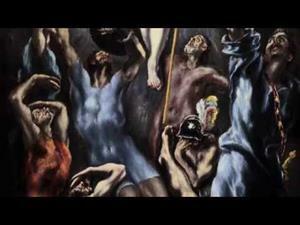 ; sold by Mrs. Marie Sterner to Agnew in 1929, New York, and bought that year by Baron Robert von Hirsch, Basel; sold at Sotheby's Parke Bernet, London, June 21, 1978 (Lot No. 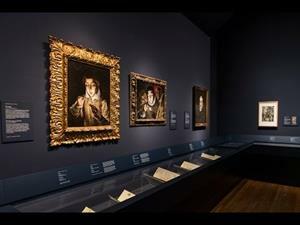 115); bought by the Spanish State at Christie's, London, December 13, 2000 (Lot No. 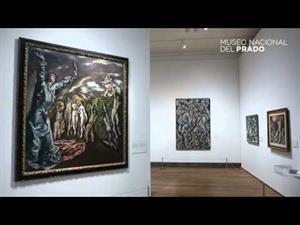 71); assigned to the Prado Museum, 2001.